-【IPHONE 6S /6 ONLY】iPhone 6s / 6 battery case 6000mah provides extra 17 hours talktime, 60 hours music time and 13 hours video time, only fits well for iPhone 6s/6（★NOT works on iPhone 6 Plus / iPhone 6S-Plus★）. -【SYNC&CHARGING】iPhone 6s / 6 battery pack supports syncing data to Macbook, PC or laptop and charging your phone simultaneously without removing it;Just slide your phone into the battery cases,cover the top cap and press the ON button for 3 seconds on the bottom of the charging case to charge your iPhone 6s / 6. -【360° PROTECTION】① The iPhone 6s / 6 battery cover is not only a portable charging case, but also a 360° protection for cellphone from scratches and other daily wear and tear.② Internal high quality chips also protect your iPhone 6s / 6 from overheating, short-circuiting and over charging. - 【PLEASE NOTES】①Compatible with traditional 3.5mm lighting headphones or wireless Bluetooth headphones to listen to music. 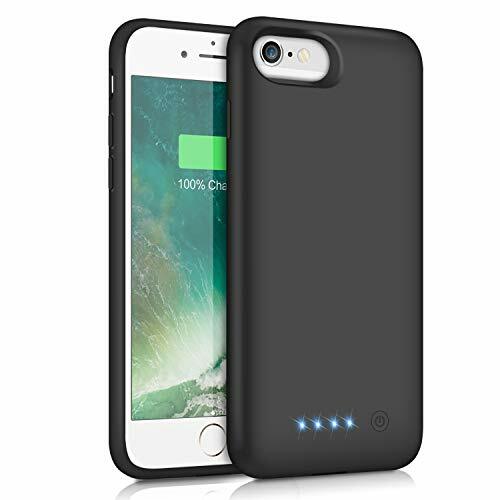 ②This iPhone 6s / 6 battery case 6000mah ONLY for iPhone 6s / 6 phone, Not works on iPhone 6s plus/iPhone 6 plus phone. -【WHAT YOU GET】 1 x iPhone 6s / 6 Battery Case 6000mAh , 1 x User Manual. Also you will receive 12 months warranty and 30-days hassle-free return service. ★Just feel free to contact us first if you have any product problem★.